The Colorado medical durable power of attorney gives the agent the ability to make decisions regarding the principal’s health care if the principal is permanently unconscious, for example. These directives come in several different types; the Cardiopulmonary Resuscitation (CPR) directive is used to inform personnel not to perform this procedure because the principal does not want it. The living will governs whether a principal consents to life-sustaining treatment like artificial nourishment. If the principal does not want to receive artificial nourishment when her condition is terminal, the living will must specifically state that, or else healthcare personnel will administer it. To take effect, a Colorado health directive must be signed by the principal in the presence of two witnesses. 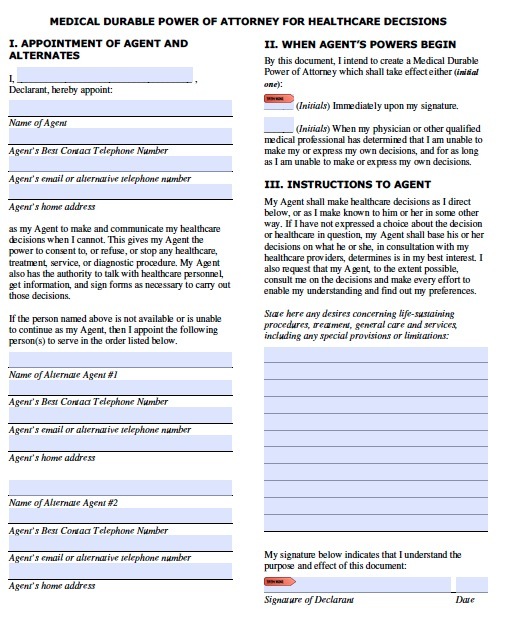 Colorado does not require notarization for health directives, but it is highly recommended. It is important to discuss what sorts of treatment you would want with your family and consider your values when doing so. Including some of your reasoning in the document as to the specific types of treatment you want can also help guide agents and physicians if you are unable to speak for yourself.